These are x-rays taken to detect decay, bone loss and other conditions such as tumors and cysts. X-rays will also help your dentist determine whether your teeth are growing abnormally, based on the positioning of your teeth and their roots. Though there are problems that can be diagnosed merely by looking and asking questions, underlying problems in your jawbone and internal tooth structure cannot be detected using the naked eye. To diagnose such conditions, your dentist will need to rely on x-rays. 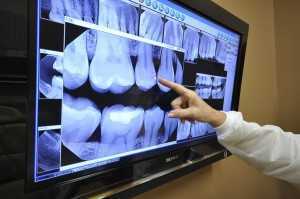 By using x-rays, the dentist will get a more accurate picture of what’s going on and how serious your oral problem is. This will allow him to recommend the appropriate remedy for you. X-rays, especially the initial X-rays, are also important because they will serve as a benchmark for your future visits. X-rays are a type of radiation. The environment we live in is full of natural radiation and as you go about your day, you are exposed to this natural radiation the whole day. When you take mouth x-rays, the amount of radiation you get exposed to is equal to the amount of radiation you get from the environment in a day. This means that the exposure levels are safe. Dentists also take precautions to minimize exposure as much as possible. For instance, lead apron-shields are used to protect your body from exposure while using fast-film or digital x-rays will cut down the amount of time required to complete an x-ray. There’s no specified frequency for taking x-rays, as each person has varying levels of dental health. After your first x-rays are taken, your dentist will advise you on how frequently you’ll need to take x-rays in future, in order to assess the efficiency of your treatment procedures. As a new patient, if you take a full mouth x-rays, they will be valid for up to 5 years. On repeat or checkup visits, you’ll need to take bitewing x-rays to assess your bite. These should be taken twice yearly to assess the development of new dental complications. Oral cancer will often go undetected if you don’t schedule regular visits to your dentist. Your dentist will check your oral cavity, lips, mouth tissue, gums and tongue for oral cancer. Other areas of interest include the neck and face. If detected early, oral cancer can be managed and cured. Gum health affects the health of your teeth. Gum disease manifests on your gums and the bones surrounding your teeth. During a check for gum disease, your dentist will check these areas for symptoms. Your dentist will also use special instruments to check for decay and cavities on the surfaces of your teeth. If you have had any restorative procedures previously, such as fillings or crowns, your dentist will examine those as well.